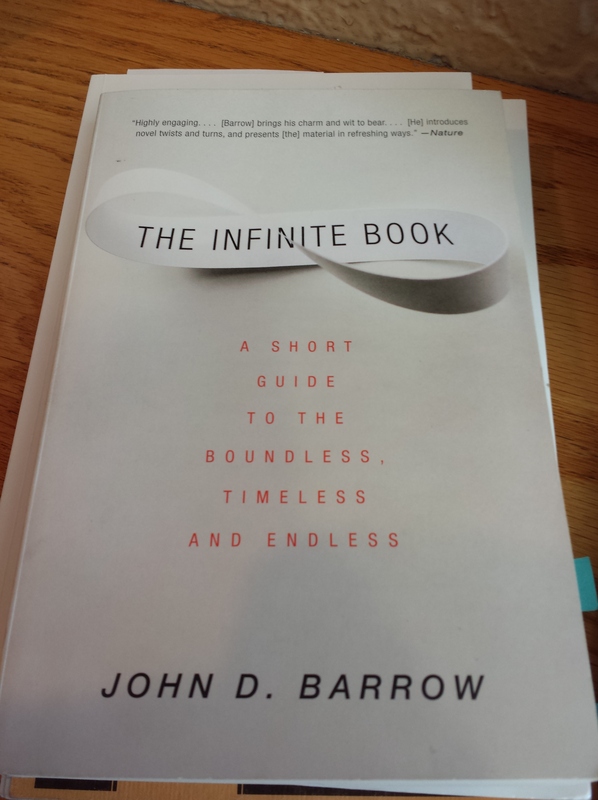 John D. Barrow’s The Infinite Book: A Short Guide to the Boundless, Timeless, and Endless is just one of those things that people like me find inexplicably attractive. Infinity. What is it? What is it not? Why should anyone care about something so intangible? For many people. infinity is just a word that they’ve been taught means, “without bound; forever; bigger than anything; beyond comprehension.” It’s usually associated with mathematics, especially math of a “higher order,” like Calculus. And it seems intuitively familiar despite an utter lack of understanding for the most part. Needless to say, common sense is not really our friend when it comes to such mind-boggling concepts. Case in point, there are different gradations of infinity, each level infinitely larger than the previous one. There are countable infinities, like the set of positive integers! And there are uncountable infinities, like the set of real numbers between any two points on the number line, no matter how small! Perhaps, most impressive of all is that there are an infinite number of levels of infinity! Despite the general mathematical nature of infinity, Barrow shows how it finds its way into a multitude of human endeavors. How big is the universe? What does it mean to live forever, corporeally or spiritually? What would it take to time travel, and what might the consequences be given different structures of the universe and time (infinite, finite and boundless, or finite and bounded)? Are there other yous out there? What are the chances of finding intelligent life in the universe? And on and on. The infinite seems to be a surprisingly recurrent topic in human thought and for good reason. There are times when the book requires a bit of concerted effort to understand, and on more than one occasion I found myself considering putting it down – not for lack of interest in the subject, but a distaste for the somewhat dense nature of some of the explanations. Points that I think should have been further explained, either through example or diagram, were not; others that I felt had been hashed out a hundred different ways found themselves once more under consideration. Barrow is clearly a scientist, and it seems odd that he would choose to skip over the more complicated details of things like topology and set theory, which are integral to making sense of the book’s main topic and its application to real-world interests. Overall , though, I think it was well written and a definite read for anyone interested in the topic. If you’re afraid you won’t be able to understand the more intimate (mathematical) details of infinity – because you never took advanced math or you have, but never touched on set theory – you needn’t worry. Barrow covers the major details early on and with surprising clarity. There are a few topics (like the brief overview of general topology that prepares you for the chapter on spatial infinities) that even I found somewhat tough to follow; however, I don’t think it’s really necessary for the layman to know such things in order to appreciate the grander points being made. All in all, I think most people will benefit from reading The Infinite Book, and don’t feel bad if you find yourself asking what? after you’ve finished – it wouldn’t be worthwhile if it didn’t make you think.